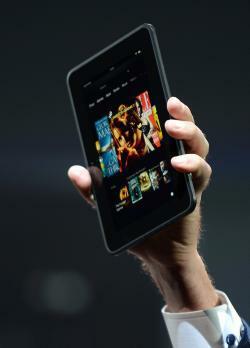 Jeff Bezos shows off a new Kindle Fire. We’ve been living through an e-book boomtime. Two years ago, Amazon turned heads by announcing that sales of digital books had eclipsed those of hardcovers, and the trend has only continued. But a recent pair of reports shows that a plateau may be coming. The Association of American Publishers claims that this year’s first quarter saw only a 5 percent increase in e-book sales, which is strikingly low compared with previous quarters. Nielsen reports that e-book sales actually fell in April, if only slightly, compared with same period last year. This is significant because it marks the first-ever decline in the market. If the current numbers hold, then e-books will maintain 25 percent of the overall book market. But Carr’s most intriguing suggestion is that the decline in e-book sales may be somehow due to the concomitant rise of tablet computing. As he explains, “With dedicated readers, pretty much the only thing you can do is buy and read books. With tablets, you have a whole lot of other options.” So readers may be leaving their e-readers behind in favor of multi-functional iPads or Kindle Fires. And there is evidence that tablets are indeed elbowing single-function e-readers out of the market (though it’s far from unequivocal). But why would this lead to a decline in e-book buying? The possible connection between an escalation in tablet computing and a decline in e-book sales raises questions about the nature of reading itself. It suggests that the medium through which a book is read somehow influences the reader’s experience. In recent years, during the e-books ascension, questions of the medium of reading have mostly been asked in terms of the differences between printed text and the display of words on a computer screen. Do readers better retain information read from a screen or from the printed page? How important is the capacity of digital books to be hyperlinked and interconnected? Is the rise in e-books helpful or hurtful to the economically disadvantaged? How important is it to be able to scribble in the margins of printed books? And how will we make flipbooks of a little stick figures running in the corner of the pages of our e-books? But if the rise of tablet computing is behind the decline in e-book sales (though, of course, we can’t yet prove it is), then the shift of medium at issue is not from print to screen, but from one screen context to another. This raises a different set of questions. The folks at TechCrunch were among the first to foresee some of the issues that would arise in a world in which e-reading is done mainly on tablets. They note that the iPad “does so many different things so well that there’s a constant urge when you’re using one to do something else. Two or three pages into a book, you’re already wondering whether you’ve got new mail, or whether anyone has added you on Twitter.” That is, tablets are distracting to readers because they offer other enticing things to do. But just how deep is this distraction? Why is it so compelling that it may be leading us away from using our tablets for e-book reading? We can again turn to Carr for guidance since his book The Shallows sounds the alarm over the effects of Internet reading on our attention. For Carr, our use of the Internet is characterized by skimming, hyperlink following, and swift page surfing, and he claims that these actions are “literally changing the structure of our brain.” These effects stay with us even after we leave the screen and, in his view, make us into shallow and distracted thinkers. As he puts it, “our online habits continue to reverberate in the workings of our brain cells even when we’re not at a computer. We’re exercising the neural circuits devoted to skimming and multitasking while ignoring those used for reading and thinking deeply.” This line of thinking can apply as well to our e-reading preferences: Our rewired brains prefer using a tablet to perform multiple shallow tasks simultaneously, rather than for perusing entire e-books with care. This sounds plausible to me, though I don’t think we need the language of “brain-restructuring” to understand the distraction tablets bring to e-reading. It’s simply the case that we’ve trained ourselves to see our computers (from laptops, to desktops, to tablets, to mobile devices) as tools for reading short and connected bursts of text. When on the computer, we’ve grown accustomed to always being one click away from email, Facebook, or a hyperlinked article. It’s like the way that when on the clock at work, we are prone to procrastinate with Web surfing and social media. These same habits may often lure us away from e-book reading on tablet computers. And unless a new appreciation for dedicated e-readers emerges, then the e-book boom may end here. *Update, Aug. 15: In his original post, Carr cited data from Nathaniel Hoffelder, general editor of the Digital Reader blog, regarding the first quarter e-book sales figures released by the Association of American Publishers. Hoffelder disputes Carr’s interpretation of his data, claiming, in part, that total e-book sales growth only appears low due to a potentially anomalous drop inchildren’s e-book sales. However, data from Nielsen and other sources cited by Carr support the idea that e-book sales are in decline.